I have been making Chevre Cheese which uses Buttermilk. You only use a half a cup with each batch of the cheese. The smallest container of buttermilk I could find was quart size. I wasn't using the buttermilk before it would go bad so I have been dumping a lot of it, and that was frustrating because it isn't cheap. I was reading through some cheese making information and found a section on How To Culture Buttermilk. Now why didn't I think of that?? Very easy. Warm the milk to 72 degrees. Stir in Cultured Buttermilk. Allow mixture to set covered, at room temperature for 12 hours or more. When thick, refrigerate. 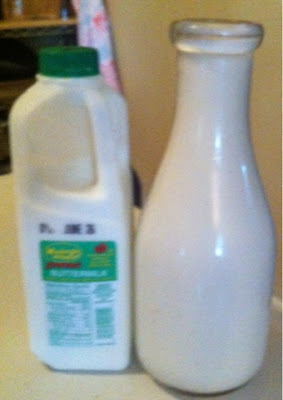 I get my cultured buttermilk from a local grocery store. I always check the expiration date and get the freshest milk. You can save some buttermilk from a previous batch to start a new batch. Just like yogurt! Buttermilk kind of grosses me out. But I like cheese! I have made Chevre, but not with the Buttermilk method. I may try this at some point. This is the only way I have made it. It is very easy and it taste really good! I'll have to try that. I usually use 1/4t mesophilic MM100 culture to a gallon of milk. The freeze dried culture lasts a long time in the freezer. I am planning on ordering some cheese making supplies, I may have to order some of that and give it a try. I've had good luck getting the pig packs on ebay and storing them in the freezer. A $15 pack will make as much chevre as you want! Kristen, Thanks for the Information, appreciate it! I have been using buttermilk for some fantastic pancakes lately! I love that cheese on toasted bread! Liz, I have been looking for some buttermilk pancake/waffle recipes so I have another use for the extra buttermilk. I am waiting for my friend to get back from Fla. to get a fresh culture from her to start making my own again. I love buttermilk. If you add some honey to it, it tastes so good! And it's good for the gut. Nice that you have that available. I need to find some ways to use it in baking etc. so I can use it up. I just had a loaf of wonderful homemade buttermilk bread. Might be a good way to use up some of the extra. That's a great idea :) I have never had buttermilk on hand so I appreciate the ideas on how to use the extra! I don't like buttermilk either. My Dad loves it in a glass with cornbread. I do like cheese, buttermilk biscuits, and buttermilk pancakes. Thanks for sharing!